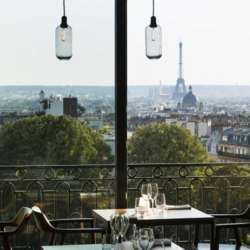 Protected content boasting panoramic views over Paris. The restaurant and bar have been designed in the style of an artist’s loft with large bay windows and a breathtaking view of the capital. The leather and wooden decor creates an industrial chic feel and the atmosphere is reminiscent of a bustling Parisian bistro. !!!!! !It's not possible to reserve a table as the policy of the hotel does not allow that, so PLEASE SUBSCRIBE ONLY IF YOU CAN ATTEND!!!!! Looking forward to seeing you soon !! !